Where can the osprey be sighted in France? Spectacular bird of prey, the osprey, once plentiful in our rivers, lakes and ponds, is unmistakable with its large silhouette and white-feathered breast and angled wings. Its expressive head is white with a dark mask across the eyes, and its fishing technique involves a feet-first spiral dive with the bird disappearing in a plume of water to catch its prey, marine or freshwater fish, sometimes sizeable. "The elegance of this striking bird is a feast for the eyes. Swift and powerful, it is equipped for long treks, equally at ease with smooth and regular wing flaps or glides and orbs (…). The show of their dynamic and unchanging fishing technique is always magnificent." Paul Géroudet, "Les rapaces diurnes et nocturnes d’Europe - European diurnal and nocturnal birds of prey"
Familly: Pandions, of which the osprey is the sole representative. There are four sub-species: the form present in the Old World (haliaetus), the form present in the New World (carolinensis), and two forms in tropical regions (ridgwagi in the Caribbean and cristatus in the Western Pacific). Sexual Dimorphism: Discrete. The female sports brown spots on her breast and the male is smaller. Call: The osprey is very silent most of the time and is heard only during the nesting period. Click here to hear its call. Life span: The survival of adult ospreys is estimated at circa 20 years. But as regards juveniles, 50% die during their first year. Habitat: close to water – ponds, rivers, canals and seashore. 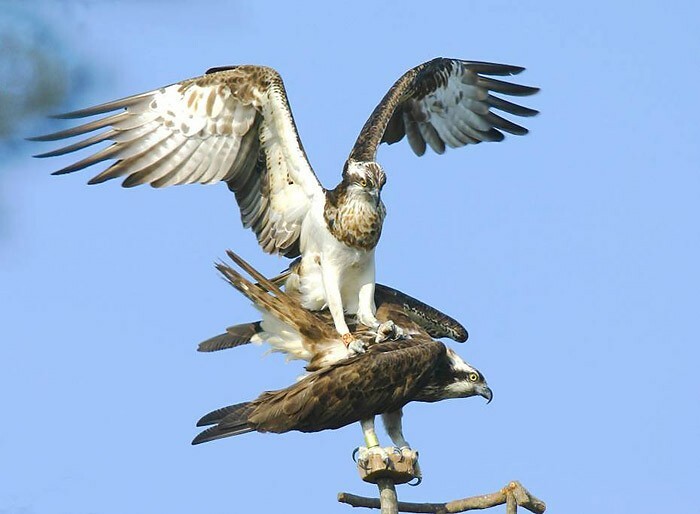 Breeding: The osprey pairs remain loyal to their nesting site and return every year. Most often, they lay 3 eggs (1-4). The female broods the eggs from 37 to 48 days and the male provides food for the family. Juveniles take flight when they are 7 to 8 weeks old. 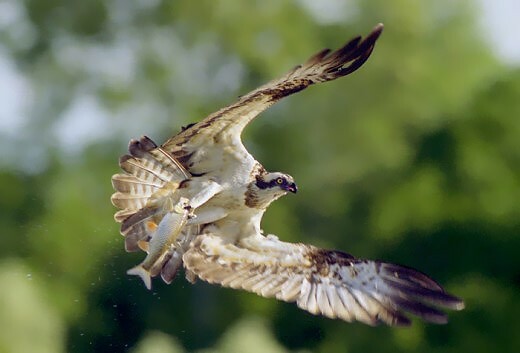 Diet: The osprey eats fish. It catches its prey by hovering over the site at 20-30m altitude, then dives more or less deeply into the water, with half-folded wings. Identification: The size of this bird of prey ranges from average to large, with long wings and a rather short tail. The arched wings are similar to those of the seagull. In flight, it is recognizable by the dark colors on its back and the pure white feathers on its chest. The feathers on the back of the adult are dark brown while juveniles are light brown with a cream-colored border along each feather. The lower parts are white with a black spot at the wrists and a black stripe under the wing. Its tail is short and square-shaped, the head is fine and wide, white with a black stripe and the black bill’s cere is grey-blue at its base as are the legs. There are no morphometric characteristics that differentiate the Corsican and mainland populations. Only one sub-species in Europe has been confirmed (Pandion haliaetus haliaetus) and the differences between both populations are of an ecological order, with a migrating population in Northern Europe and a sedentary and erratic population in the Western Mediterranean. The potential existence of gene flows between both populations remains undocumented for the moment. Pairs: en 2009, 29 breeding pairs in Corsica and 31 in mainland France. Wintering: several cases recorded every year. Under 10 birds. Migratory: several thousand birds fly over France in the spring and fall. In France, like all other species of birds of prey, the osprey is protected under the July 10,1976 Act (enforced by the decree of April 17, 1981). In addition, it is listed under Appendix 1 of the « Bird » Directive » (n° 79/409 – April 6 ,1979). This European Directive applies to all Member States since April 6, 1981. Its objective is to protect all bird species listed under Appendix 1 of this Directive and enables the designation of specially protected areas to strengthen the Natura 2000 network. 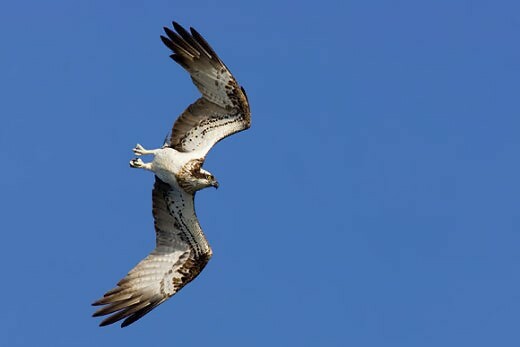 The osprey also appears in Appendix II of the Bern Convention whose purpose in Europe, is to guarantee the conservation of the natural flora and fauna and their natural habitats, particularly in the case of the conservation of species and habitats that require the cooperation of several States. Furthermore, as a migratory species, the osprey falls within the worldwide protection status of the Bonn Convention (Council, June 24, 1982). As all other endangered natural fauna and flora, the osprey is protected by CITES also known as the Washington Convention. This Convention on the International Trade of Endangered Species is an international agreement between States aimed at ensuring that the international commerce of natural animal and plant specimens does not jeopardize the survival of the species concerned. The osprey is also on the Red List that applies to tspecies considered as endangered, vulnerable and/or rare due to their limited populations or to the trends in population evolution. It is classified under the CMAP 1 category (Conservation Mérite Attention Particulière-Conservation Warrants Special Attention), that lists all endangered species with vulnerable bird status at the scale of the planet. In addition, it appears in the SPEC 3 category that covers species whose status in Europe is unfavorable and whose global population is not in Europe. 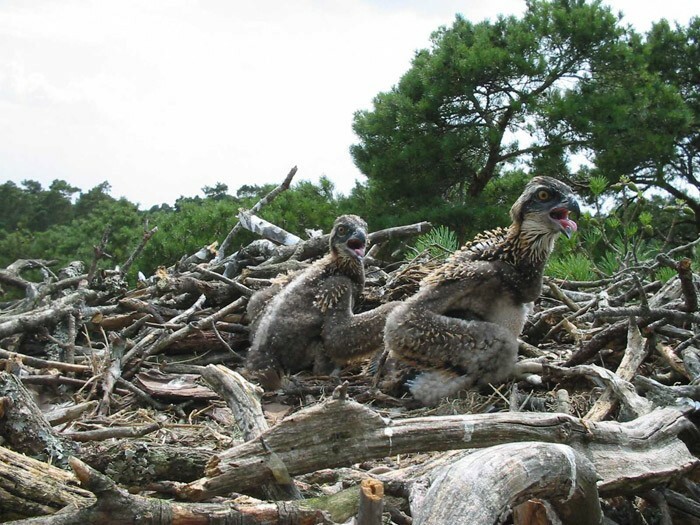 Two osprey populations, with distinct ecological features, are present in mainland France. In Corsica, ospreys are sedentary or erratic in the Mediterranean Basin, and they nest on the cliffs of the Western coast. On the continent, the species nests in forest trees and migrates to the southern Sahara. The European population winter in Africa, except for the Mediterranean birds (including those in Corsica). The osprey, a powerful and large migratory bird, uses a wide migration front and is not afraid to cross seas and deserts. The year’s juveniles also migrate in September and stay in the wintering sites for 1 or 2 years before returning to Europe. During the spring and fall migrations, ospreys stop in favorable sites (rivers, ponds), often alone but sometimes in pairs or in small groups. Their stay can last over several days or weeks. The only major gatherings are observed in the wintering area (up to 25 individuals), and more specifically along the coasts of French Guyana. The birds arrive in their wintering lands at the end of September or early October. Wintering consists in spending the winter season under more temperate climates. 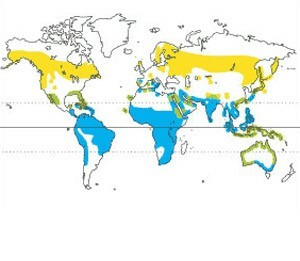 The Northern Europe populations, joined by the nesting birds in mainland France, winter in the tropical region located between Senegal and Ethiopia, essentially in West Africa, between Mauritania, Mali and Gabon. Several Nordic birds have also been sighted South of the equator and Africa. The population wintering in East and South Africa could come from Russia and perhaps Iran. In March, from 1 to several thousand adult ospreys cross France. Migratory stopovers are shorter than in the fall, due to the fierce competition for nesting sites in Northern Europe. In the Centre region, arrivals on site occur from early March (Loiret) and continue into April. The nesting pairs from the Mediterranean Basin settle in in February. First-time nesters arrive on average a month later than the experienced adult pairs. Ospreys do not breed before their 3rd year. There have however been sightings of two-year old non nesting birds on breeding sites. Some of them build a « test » area but do not lay eggs. After several years of trials, they are able to mate successfully. Pairs do not form in the wintering sites. In breeding sites, the male builds one or several nests that it proudly flies over every day in the hope of attracting a partner. Females usually choose the nest that they find the most suitable, but in some instances, they fly away. The male can then follow her to another region or stay to « propose » his nests to other females. When females accept the nest, they will help the male to consolidate it (consists in « refreshing » the initial nest), will mate in the nest, after the male has provided fish. 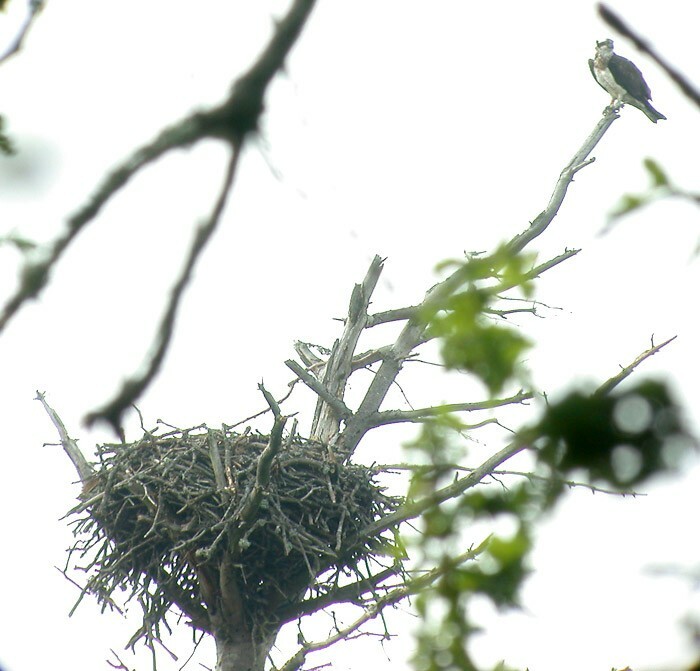 The nest is built in a quiet, perched site, with a wide visual field, often close to fishing sites, but not necessarily near water: some pairs can fly over several kilometers to find food and nest in forests, mainly in clearings. The nest can be used by the same pair for several consecutive years, even if breeding is unsuccessful. The nesting area is built with dead branches collected on the ground, at the surface of the water or in trees. Its center is garnished with finer materials: twigs, herbs, leaves, moss... The diameter of the nesting area can reach 1 to 1.5m and is sometimes larger. Its construction takes from 2 to 3 weeks and branches are added yearly. Over time, its height can exceptionally reach 2m (in the Centre region, most nesting areas are 40 to 70 cm high). 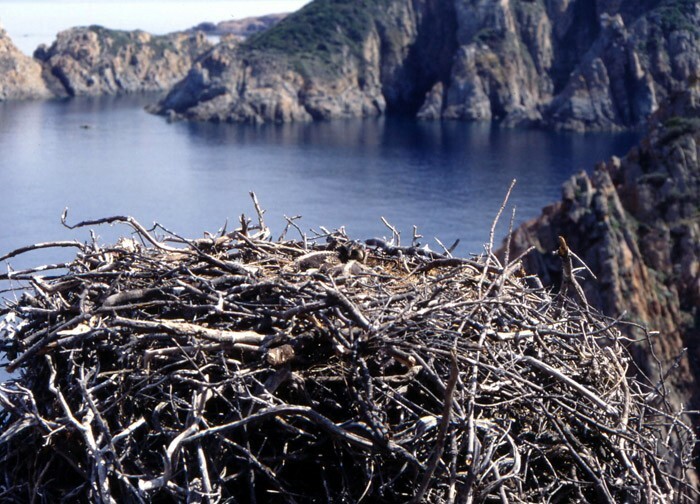 The presence of older nests partially contributes to successful breeding. Two to 3 eggs are laid, with an interval of one day between eggs. More rarely, pairs have been seen to lay up to 4 eggs, and others only 1. Like in the case of all diurnal birds of prey, there is only one laying cycle per year. Both parents, but more so the female, take turns brooding the eggs for an average of 37 days between mid-April and early May. Chicks do not all hatch at the same time, but each in its own time. Chicks are considered to be altricial, i.e., they are unable to move or feed themselves on their own. The female remains in the nest permanently during the first 10 days, to keep the chicks warm. In bad weather, she can continue to protect them up to 28 days. She then is content to guard the nest, perched a short distance away, and shelters her offspring from the sun by stretching her wings over them to provide shade. The chicks are fed by the female, while the male is in charge of bringing food to the nest: 4 fish daily for the first 10 days, 4 to 5 over the next 10 days, and up to 5 to 7 fish until the age of the first flight, which takes place when the juveniles are on average 51 to 53 days old (in July and August). The male then often flies over the nesting area, holding a prey in its claws to encourage the juveniles to leave the nest. After the first flight, the parents continue to feed the juveniles for another month. The juveniles mainly look to the male and watch him fish. They will only be able to fish properly 7 weeks after leaving the nest, where they return to sleep from several days to several weeks. The male regularly provides living prey. Families can stay together until the fall (and up to July-August in the Centre region). The female is the first to leave the nest, closely followed by the juveniles, and the male leaves last. 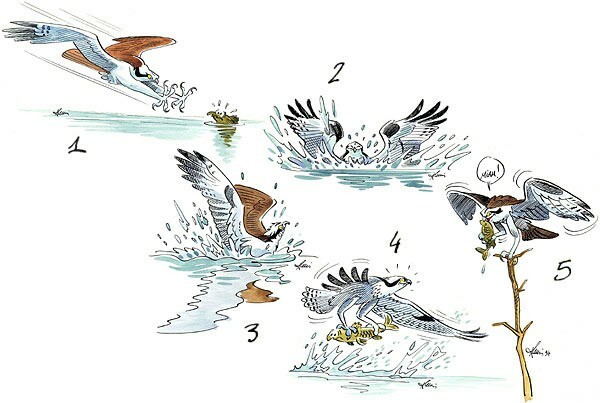 Ospreys are exclusively piscivorous, i.e. they only eat fish. They fish most often in clear water, where preys are easy to see (Corsican populations fish in seawater and the mainland birds in freshwater). They capture fish that swim close to the surface and can dive 1m deep into the water, after detecting their prey in flight or from their perch. Several morphological transformations required by this fishing technique make the osprey a specialist: fairly long and strong legs, curved inward claws, (able to point two fingers forward and two backward), spicules on the inferior surface of the fingers to seize slippery fish, dense and compact plumage. The diversity of fish species exploited is considerable, whether this involves fresh or seawater fish. The fish measure between 10 and 50cm (25cm on average). The literature mentions cases of ospreys that have drowned, their claws caught in the bones or the scales of too heavy prey, usually released. While the osprey can be found in most fish-rich regions, it does not accept to settle just anywhere. Ospreys are present in a wide range of climates: in Europe, Asia, Oceania, North and East Africa, as well as in North America. They avoid more arctic regions or high mountain ranges. Their presence depends entirely on the availability of fish. The saline content of the water is of no importance: the species nests along the seashore as well as more inland. Locally, ospreys can be very demanding. They nest almost exclusively in the North Palearctic (except on power lines in Germany), usually close to lakes or streams. They only settle on rocky outcrops and on small Mediterranean islets where they favor the coastal areas. Elsewhere, where populations still abound (North America), it is sighted in sometimes unexpected places: power lines, bridges, towers, ruins, on the ground… The choice of the nesting site is much wider in regions where nesting pairs are in greater number. The osprey nests on the ground in most Red Sea islets, as well as in New Caledonia and Australia. The summer moult occurs after breeding and lasts 2 months: July and August. The winter moult starts in November in the wintering areas and continues until February. It lasts 3 months and ends just before the return migration. 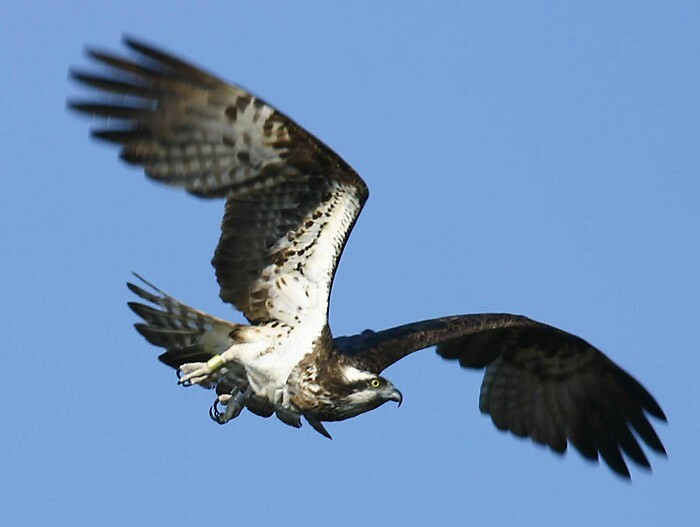 The annual survival rate of adult ospreys (over 2 years) is fairly high (maximum longevity: 24-25 years in the wild). The survival of juveniles and sub-adults is more difficult to assess. They are not territorial in the first year of life and the opportunities to monitor them are rare. 43 to 60% of first flight juveniles could survive their first year. Globally, out of 100 juvenile ospreys that survive until the first flight, 37 will still be alive 4 years later and will be able to mate. Eight years later, 17 of these will still be alive. Only 6 to 8 birds will reach the age of 12. There are breeding pairs that are over 20 years old; there is even a banded individual who lived to be 27 years old. Ospreys do not thrive in captivity and die on average after 2 years. One of the osprey’s most striking features is its gregarious nature. The defended territory is variable in size and limited to the immediate vicinity of the nesting site. The fishing territory is easily shared. In this sense, the osprey is different from the other birds of prey that defend their hunting grounds. However, near the nest, disputes can be rough. Pairs can also settle amidst distant colonies, the nests can then be several hundred meters even kilometers apart, as in the Centre region. In North America in particular, there are real colonies, close to sites where fish abound. The nests here are only short distances away from each other. Such cases have not been documented in Europe.